Navels And Tangerines, Sweetness We Want To Share! Floridians are very fortunate to have these two favorites together at the same time during the holiday season. That’s what makes this gift so popular and we just want to share the sunshine. 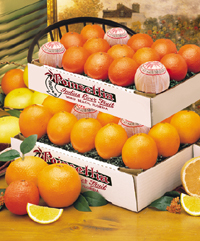 Lucky recipients will delight in the grove-fresh flavor of our Navel Oranges, and the explosion of sweetness our Tangerines possess. That both varieties are easy to peel is the icing on the cake.